Is the Extension supported in my Opera browser? The Xton Access Manager Extension is supported as an extension for the Opera browser; however, it is not available within the Opera Extension marketplace. If you are using Opera, please follow this procedure to deploy the Xton Access Manager Extension. Install the Opera extension “Download Chrome Extension” (external link) to your Opera browser by clicking the Add to Opera button. The extension should be deployed and enabled by default, if it is disabled, then from within Opera open the Extensions page (Ctrl+Shift+E) and click the Enable button for the extension Download Chrome Extension. Now open the Xton Access Manager Extension for Chrome (external link) to download and install the extension. From within the Chrome Extension page for Xton Access Manager, click the Add to Opera button. Click the Add to Opera button. Read and then click OK on the confirmation dialog to continue. Read and click OK on the Download Chrome Extension confirmation dialog. 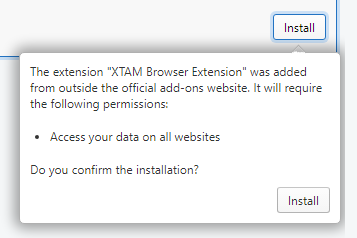 In the Opera Extensions page, locate the “XTAM Browser Extension” extension and click the Install button for it. Install the XTAM Browser Extension from Opera’s extension page. When prompted, read the permissions that are required for the Extension and then click Install to continue. Read and confirm the permissions required from the Extension. Click Install when ready to continue. The Extension will now be installed to your Opera browser and become available in the bar along the top. The Xton Access Manager Extension is installed to Opera and ready for use. Now that the Extension has been successfully installed to Opera, read the following FAQ How do I use this Extension? to learn how to configure and use it.